This animal pest alert provides information on the identification, biology, and pest potential of the rusa deer in Australia. The rusa deer (Cervus timorensis) is also known as the Timor deer, Sunda sambar, Javan rusa and Moluccan rusa deer. It is not native to Australia, but has established populations here, as well as in other countries. The rusa deer has significant potential to spread further in Australia and become a pest. The rusa deer has a head and body length of 142-185cm; a shoulder height of 83-109cm; a tail length of about 20cm and a weight of 50-115kg. Males are larger than females. The summer coat is sparse and reddish-brown, darker on the rump, lighter on the chest and white around the chin and throat area. In winter the coat becomes greyer in colour and thicker. Rusa fawns do not have spots and are reddish-tan in colour with white underparts. Stags (mature breeding males) develop a dark, heavy mane. They have lyre-shaped, three-pointed antlers (12-69cm along the main antler beam). The innermost point of the antler is the longest of the three and is a continuation of the main beam. Immature male antlers are mere bumps or spikes. In addition to rusa deer, five other deer species are established in the wild in Australia; red, sambar, fallow, hog and chital. These deer are found in varying numbers around the country. 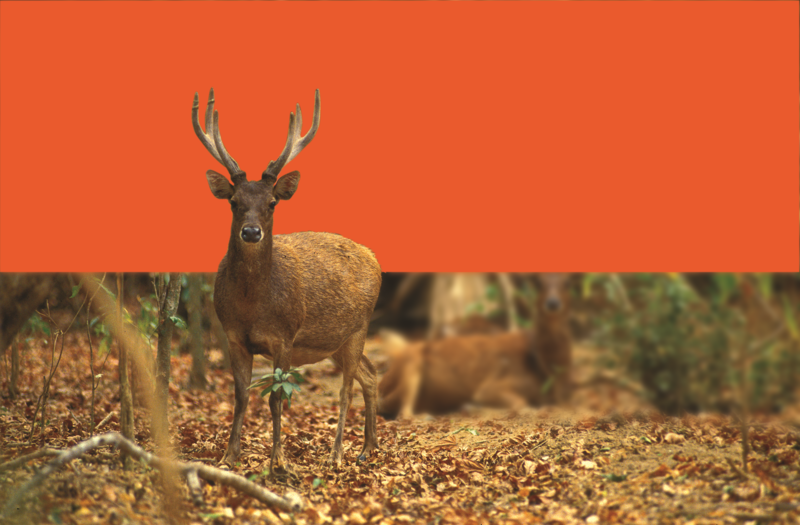 Red and fallow deer are the most widely distributed and sambar deer are found in the highest densities. The red deer is larger than the rusa, with a weight of 136-158kg. The summer coat is reddish and in winter greyish-brown. It has a distinctive light-coloured patch on the rump. Fawns are brown with white spots, but this coat is soon replaced with uniform dull brown. Mature adult males have multi-pointed antlers (usually six to eight points and less frequently 10 to 12). The sambar deer is the largest species in Australia, similar in size to a small cow, with a weight up to 300kg. The coat is dark brown and the ears are large, rounded and about half the length of the head. The tail is bushy, longer than the tails of rusa and red deer, and is carried raised over the back when the animal is disturbed. Mature males have three-pointed antlers, slightly longer than those of rusa deer. The fallow deer is similar in size to a domestic goat, with a weight of 50-110kg. The coat varies widely in colour, but the most common forms are fawn or black, with large white spots. It also has distinctive white markings on the tail and buttocks. Similar to the sambar deer, the tail is raised over the back if the animal is disturbed. Mature males have multi-pointed, palm-like antlers that look very different to those of other species.